Educating and Facilitating... Together we can make a difference! Friday June 23 at 7:00 p.m., Saturday June 24 and Sunday June 25 at 2:00 p.m. 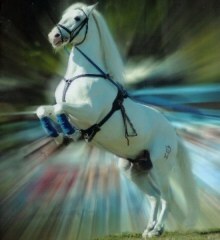 Founded in the 16th century for the exclusive use of the Hapsburg Royal family of Austria, the Lipizzan is unquestionably the rarest, most aristocratic breed of horses in the world. Assisting General Patton during World War II, the Herrmanns smuggled the royal stallions out from behind enemy lines to save them and feel the horses rescued were more precious than jewels. Only a few hundred have ever existed at any one time. Foremost among the leading breeders of Lipizzans is the Herrmann family who maintain a ranch in Florida to help insure the continuation of this extraordinary breed. 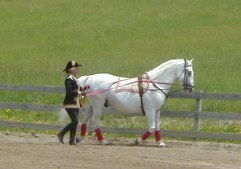 The Herrmann Royal Lipizzans are the only horses outside of Austria authorized to wear the Royal Hapsburg brand. 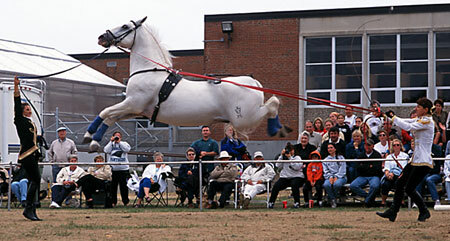 The Herrmanns bring their magnificent Royal Lipizzan Stallions to the Ulster County Fairgrounds for an amazing equestrian show. These majestic horses are world-renowned, having appeared in the Disney movie Miracle of the White Stallions, as well as Radio City Music Hall. Ticket prices at the gate are $18 for adults, $16 for seniors, and $12 for children 6 to 12. Children 5 & under are free. ERR is a non-profit organization helping horses in need. Their volunteer network offers rescue, rehabilitation and adoption services to horses that have been abused, neglected, abandoned or unwanted. Educational information is also available on this website. 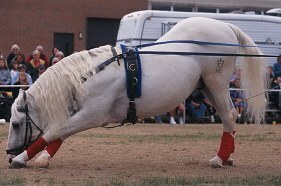 A Lipizzan stallion demonstrates the capriole-in-hand, a movement once used on the battlefield. At this time only cash or checks can be accepted at the door. For security purposes, tickets purchased online will be available at the gate 30 minutes prior to performance. Call for groups of 10 or more. All advance sales end Friday, June 20th. 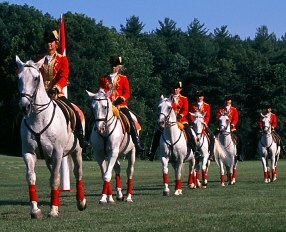 In the military quadrille, stallions and riders demonstrate precision exercises once used as preambles to battle. PRIVATE LESSONS FOR ADVANCED STUDENTS ONLY. Bridge. Take Route 9W North 2 miles to Route 299 (to New Paltz). directions from New Paltz Toll Plaza above. COME OUT AND SPEND THE DAY! Vineyards, boutique shops, campgrounds, equestrian centers, designer outlet shopping, hiking and much more! Click here to view our current press release.